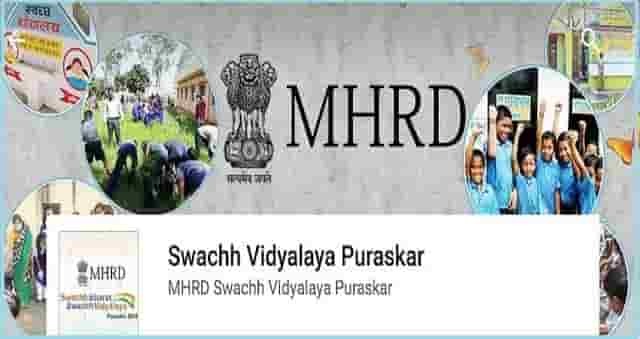 MHRD Swachh Vidyalay Puraskar 2017 Last date for apply: MHRD Swachh Vidyalay Puraskar 2017 Last date for apply-Swachh Vidyalay Puraskar(SVP) 2017:The Swachh Vidyalaya Puraskar is instituted by the Ministry of Human Resource Development, Government of India to recognize, inspire and celebrate excellence in sanitation and hygiene practice in Schools. The explicit purpose of the awards is to honor schools that have undertaken significant steps towards fulfilling the mandate of the Swachh Vidyalaya Campaign. Objective:To recognise, inspire and celebrate excellence in sanitation, water and hygiene practice in schools and to sustain good practices.Its explicit purpose is to honor schools that have undertaken significant steps towards fulfilling the mandate of Swachh Vidyalaya Campaign. The Ministry of Human Resource Development (MHRD) has announced that the last date to apply for the Swachh Vidyalaya Puraskar is on November 15, 2017. Schools which are interested in being contenders for this award can apply for the same from the official website (swachhvidyalaya.com). Goverment schools, government aided schools and private schools in both rural and urban areas are eligible for this award. It was initiated in 2016 to “recognize, inspire and celebrate excellence in sanitation and hygiene practice in schools”. Schools which have taken “significant steps” for fulfilling the campaign will be honoured through this award. School which have gained at least two stars out of five in adherance to norms are eligible for the award and will be judges on the categories of water, toilets, handwashing with soap, operation and maintenance, behaviour change and capacity building. The awards would be presented at the district, state/union territory and national levels. C and DSE, Ex-Officio SPD SSA, Telangana :: Rc. No.3623,Dt:01-11-2017. Sub: TSSA Hyderabad - Swachh Vidyalaya Puraskar 2017-18 -Participation by all the Schools in the State - Certain Instructions -Issued - Reg. Read: 1.This office Procs.even no. dated 21.09.2017 & 09.10.2017. 2.LetterNo.F.27-11/2017-EE-16,dated 25.10.2017and 26.10.2017of Government of India. The attention of all the District Educational Officers & EO-DPOs of SSA in the State is. invited to the reference read above where in necessary guidelines were issued for participation and uploading information of all the Schools in the State for Swachh Vidyalaya Puraskar 2017-18 by 31.10.2017. In this context, they are informed that the Government of India vide reference 2"d cited, extended the last date of submission of application and uploading information of all Schools from 31.10.2017 to 15.11.2017. Therefore, they are requested to ensure that all the schools shall register and upload the information for Swachh Vidyalaya Puraskar before 15th November 2017. Further they are requested to take necessary action on following. - Constitute district level committee headed by the district Collector (or her/his appointee) and comprising DEO, three eminent school teachers, superintendent, engineer (water supply/PHD), district health officers and two members from Civil Society Organizations/NGO's. - The process of awards at district level would commence immediately after the conclusion of process on 15.11.2017. - The district level committee should shortlist the schools for district level awards as per guidelines of SVP 2017-18 and finalize the schools for district level awards and submit the results to this office by 30.11.2017. They are requested to take necessary steps to expedite process of submission of application by all schools before 15th November 2017 and to start selection of schools for district and sub category award as per the guidelines. Sub: TSSA, Hyderabad - Planning & MIS - Instructions to the DEOs & E.0 DPOs in the State - Swachh Vidhyalaya Puraskar2017-18 -Reg. Ref: 1. Govt.Memo.No. 7136/SE-Prog.I/2017-1, Dt: 13.09.2017. 2. Proc.Rc.No.3623/TSSA/Plg/T7/2017, Dt: 21.09.2017. The attention of all the District Educational Officers and E.O P.Os in the State is invited to the references read above. They are informed that with an extensive participation and involvement of HMs, Mandal and District officials in applying Swachh Vidhyalaya Puraskar during the academic year 2016-17, Telangana State got 5th position and 14 schools have selected and received awards at national platform at New Delhi. With the increased spirit and with an aim to stand in a 1st position at National Level during 2017-18.It is proposed to conduct on mega campaigning in the Districts. Therefore, all the DEOs & E.O POs and other District Officials are directed to organize the campaign successfully and support each and every school being a part of the campaign on the following instructions and submit their reports on or before 15.11.2017. The District can be considered as a UNIT and all the schools in district are directed to apply for Swachh Vidhyalaya Puraskar awards 2017-18 during the date and time specified. DEOs are directed to issue necessary instructions to all the Government, welfare and private unaided schools to apply for the Swachh Vidhyalaya Puraskar 2017-18 at a specified date and time. Water, Sanitation and Hygiene (WASH) programs. Also services of previous year (2016-17) Swachh Vidhyalaya Puraskar Awardee School HMs or Teachers. Form a district level Swachh Vidhayala Puraskar committee and inform the state immediately with complete details of committee members. DEOs must organize a meeting with MEOs, selected I trained HMs and awarded school HMs I Teachers to plan for a mega entry campaign. Data must be entered by HMs only through his/her smart phone. Or else, HMs can take the support of MEOs /MIS Coordinators for entering data. Data must be entered in the presence of HMs. Resource persons can individually pursue the schools left over after the campaign and helpthe schools in applying before 21st October, 2017 for SVP. Create a closed SMS groups to monitor the SVP nominations within the mandals and districts. Interactwith line departments like RWS & S, SBM (G), SMB (U), DRDO, Health, WCDM and other departments to participate in mega campaign and support the schools HMs. Apply through Website:www.swachhvidyalaya.com also download the app @ 07097298093 to download mobile app. DEOs are directed to appraise the District Collector and other district key line Department officers regarding the SVP-2017 and mega entry campaign. Re. No.3623/TSSA/PLG/T7/2017; Dated:21.09.2017:: Sub:-TSSA- Inclusion of all school for the award for Swacch Vidyalaya Puraskar 2017-18- Certain instructions issued-Reg. Ref: Govt. Memo. No.71361SE-Prog.l/2017-1, Dated: 13.09.2017. With reference to the subject cited, it is hereby informed that, the MHRD has constituted the Swacch Vidyalaya Puraskar in the year 2016 under the Swacch Bharat, Swacch Vidyalaya initiative to recognize, inspire and celebrate excellence in sanitation and hygiene practice in elementary and secondary schools. The explicit purpose of the awards is to honour schools that have undertaken significant steps towards fulfilling the mandate of the Swacch Vidyalaya Campaign and the awards are given at the District, State and national levels.. Therefore, all the District Educational Officers in the State are requested to issue necessary instructions to all the schools in the State i.e. private schools affiliated to CBSE, CISCE, State Boards as well as Central Government Schools i.e. Kendriya Vidyalayas, Navodaya Vidyalayas, Sainik Schools etc. Thus, the Swacch Vidyalaya Puraskar 2017-18 will be open to Government, aided schools and Private schools in both rural and urban areas to participate in the award scheme to ensure a quick dissemination of the concept at the block and the school level. As you would be aware, the Ministry of Human Resource Development has constituted the Swachh Vidyalaya Puraskar in the year 2016 under the Swachh Bharat: Swachh Vidyalaya initiative to recognize, inspire and celebrate excellence in sanitation and hygiene practice in elementary and secondary schools. The explicit purpose of the awards is to honour schools that have undertaken significant steps towards fulfilling the mandate of the Swachh Vidyalaya Campaign. The awards are given at the District, State and National levels. 2. It is a matter of satisfaction that more than 2.68 lakh schools participated online in the first edition of the awards. Out of 643 State level award winning schools, 172 schools have been awarded with the National level awards for Swachh Vidyalaya Puraskar 2016-17 on 1st September, 2017. Three best performing States and 11 districts with highest participation at National level of Swachh Vidyalaya Puraskar have also been recognized at the award ceremony on 1st September, 2017. 3. Swachh Vidyalaya Puraskar 2017-18 has been formally announced on l5th September, 2017. The guidelines ofSwachh Vidyalaya Puraskar 2017-18 are enclosed herewith. As per the guidelines, schools will register and submit information as per the prescribed format made available online (http://mhrd.gov.in - SwachhVidyalaya - SwachhVidyalayaPuraskar or by \\downloading a mobile app, SwachhVidyalayaPuraskar 2017 - 18. The mobile app can be downloaded from Google Play Store. (a) Organise a State level orientation workshop quickly, to be attended by Principal Secretary (Education), State/district level Education officials including Resource Centres, Cluster Coordinators, all DEOs, Consultants and other concerned officials. This workshop will help to understand the framework/tools and methodology better. (b) Ensure a quick dissemination of the concept and actions required, at the block and the school level - issue necessary instructions to schools to~articipate in the award scheme. 6. On submission of the application by the schools, the data will be aggregated into sta, rating categories (one to five) by the App and the performance report of the school would be shared with the states/districts/schools. Depending upon the rank category they belongto, the schools would be awarded at different levels, subject to physical validation and screening at different levels. 7. I may be noted that UNICEF and Administrative Staff College of India, Hyderabad (ASCI) are collaborating with us in this process, for technical support, and they may reach out to you, for facilitation of the same. 8. For any further clarifications, you may contact Shri Girish Hosur, Director in this Department, Tel. No. 011-23073687; email: hosur.edu@gov.in and Prof. V. Srinivas Chary, Director, Centre for Energy, Environment, Urban Governance and Infrastructure Development at ASCI, Hyderabad; Tel No. 91-40-66534221 email: schary@asci.org.in. Swachh Vidyalay Puraskar(Awards) 2017-2018: The Swachh Vidyalaya Puraskar was instituted by the Ministry of Human Resource Development, Government of India in 2016 to recognize, inspire and celebrate excellence in sanitation and hygiene practice in schools. The explicit purpose of the awards is to honour schools that have undertaken significant steps towards fulfilling the mandate of the Swachh Vidyalaya Campaign. Eligibility: The awards will be open to (a) Government and aided schools; and (b) Private schools, in both rural and urban areas. Behaviour Change and Capacity Building. 90% - 100% of the Norms ***** Excellent Keep it up!! * Each school should score a minimum of two Star rating in each of the Sub-categories in order to be eligible for any award. Online (web/ mobile) applications received before the cut-off date will be screened by a District level Committee headed by the District Collector (or her/his appointee) and comprising of District Education officer, three eminent school teachers, Superintendent Engineer (Water supply / PHD), District Health Officer and two members from civil society organizations/NGOs. b) In addition, two schools(one elementary and one secondary) having the highest score in each of the Sub Categories with rating not below five star in the sub-category will be selected for sub-category award at the district level (Total 10). The district level committee may get a physical verification of the nominated schools done by a team consisting of school teachers and students in the district. The verification would be done using a check list and by taking photographs. Each of the selected schools with highest overall score (Total 8) and each of the schools having the highest score under each sub-category (Total 40) will be awarded with certificate of recognition at district level, provided that all the schools with an overall rating of five star would be awarded with a certificate of Recognition. Schools selected for District Level Awards with overall rating not less than four Star will be considered for the State/UT Level Awards. In case the number of Schools in a district having five star Rating is more, all the schools having overall five star Rating will be considered for State/UT Level Awards. These schools will be screened by a State/UT Level Committee headed by the State Education Secretary or her/his nominee and comprising of Director (Education), Director (Health), two eminent school heads (selected by the State Education Secretary), Chief Engineer (Water Supply & PHD), Director (Panchayati Raj), Director (Urban Local Bodies), representatives of Civil Society Organizations as members. Twenty Elementary and twenty Secondary schools having the maximum score and rating not less than four Star from Urban & Rural Areas (5 from Urban and 15 from Rural) will be selected for State/UT level awards. The State/UT Level Committee may get a physical verification of the selected schools done by a team consisting of school teachers and students in the district. The verification would be done using a check list and taking photographs. The State may also decide to confer these schools with additional grants/funds for incentivizing them. A maximum of twenty entries each at Elementary and Secondary level would be considered for the National Level Award. A maximum of 40 schools selected for State/UT Level Awards with rating of ﬁve stars from each State/UT will be considered for National Level Awards. 100% physical veriﬁcation of the nominated schools will be done using a check list and by taking photographs. All schools are invited to apply for the awards.Registration opens from 1st September 2017 and closes on 31st October 2017. The registration of schools would be done with the U-DISE code of the school. If you do not have a UDISE-Code, download the Data Capture Format (DCF) and submit at Block / District / State level office to generate the U-DISE Code. Schools will first complete the Primary Information section in the prescribed format. Upon submission, a "Password" will be send to the mobile number given by the school in the primary information section. Schools will then login with the U-DISE code and Password to complete the rest of the six sections of the survey. online (http://mhrd.gov.in → Swachh Vidyalaya → Swachh Vidyalaya Puraskar) or by downloading a mobile app, Swachh Vidyalaya Puraskar. The mobile app can be downloaded from Google Play Store or byvgiving a missed call @ 07097298400. The registration of schools would be done with the U-DISE code of the school. II. The website/mobile app is customized to cater to different categories of schools. III. Schools are expected to provide accurate information as required in the format. IV. The information in the format corresponds to the requirements in Swachh Vidyalaya guidelines. Annexure 2 provides the list of indicators categorized under (a) Water (b) Toilets (c) Handwashing (d) Operations and Maintenance (e) Behavior Change and Capacity building. I. The performance of the schools against categories will be scored as per the method given in Annexure 3. Eligibility: All Government and Government Aided Schools in Rural and Urban areas. i) Video conference to orient district level officials on the frame work, Web Portal, Ranking of Scores and Rationale etc. with ASCI’s resource support on 5th July 2016 from 2:00 to 3:00 PM. Instructions have been sent to districts. State Sectroral Officers who are acting as District Incharges shall oversee the process of nominations. SPO – State Sectoral Offices (District Incharges) DPO – Sectoral Officers (Mandal Incharges) MEO / MIS Coordinators – Shall be responsible for online entry of all school nomination of their mandal. School Complex HM / CRPs – Shall be primarily be responsible for online entry of all schools nominations of their cluster. Head Masters of all Govt., Govt. Aided Schools – Shall self nominate for Swachh Vidyalaya Puraskar. e. Behavior Change and Capacity Building. 90% - 100% of the Norms Greeen / ***** Excellent. Keep it up! 51% - 74% adherence to the Norms Yellow / *** Good, but there is a scope for improvement. Only Orange and above are eligible for award. * Each school should score a minimum of orange rating in each of the Sub-categories in order to be eligible for any award. 1. 100 Elementary and 100 Secondary schools (70 Rural, 30 Urban) will be awarded Swachh Vidyalaya Puraskar. 2. 50,000/- Additional School Grant and Certificate of Recognition . 3. In addition best performing districts (total 10) that will be judged on the basis of percentage of total schools with GREEN rating. 1. Self Nomination by Head Masters through online questionnaire. g. Facilities for handwashing with soap after use of toilets and before mid-day meal/ lunch. h. Website: mhrd.gov.in. – Swachh Vidayalaya – Swachh Vidayalaya Puraskar. a. Mobile Application can be downloaded by giving a Missed Call to 07097298400 or from Google Play Store. b. Committees at different levels will physically verify the eligible schools for selection. c. District level committee - headed by District Collector (or his/her appointee), comprising DEO, 3 Eminent School Teachers, Suprintendant Engineer (Water Supply / PHD), District Health Officer and Two members from Civil Society organisations / NGOs.